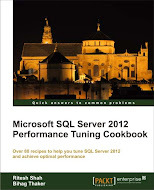 I wrote my previous article about different type of JOIN in SQL-Server 2005. Due to the space constraint in that article, complex example has not been given there, only few simple examples. I felt to explode this topic further by giving solution to some really needed business logic. If you want to create report for blood testing laboratory, who used to check samples of employee of different companies for different purposes. Following should be the table structure, we will be creating three table. One will store information about Order received from different companies. Another one will be the detail of that order, means which company sent how much samples of how much employee?? And the last one is further more details about how much test should be performs on which sample??? Let us create three tables. Now, child table of above. Now, this is time to insert few records on above tables. Well, now we are ready to pull data out of three tables with different type of JOIN which we have seen in my previous article. NOTE: many different logic can be used to perform following tasks, I am giving this just to explain the use of JOIN otherwise there are some more facility which can handle all of the below situation other than join. You can use following query which has used one LEFT OUTER JOIN and one INNER JOIN. If there is a need to find how many samples came from which company. Use following query with aggregate function COUNT.